The results of the first round of local and regional elections in Greece are turning into a political test for the coalition government ahead of the EU elections next Sunday (25 May). EURACTIV Greece reports. Greece’s leftist Syriza party performed strongly in key races in the first round of local elections yesterday (18 May), as voters poured out their anger at the government’s austerity policies. The vote, along with European Parliament elections late this week, is being closely watched as a guage of sentiment towards the coalition of Prime Minister Antonis Samaras, which came to power two years ago and holds just a two-seat majority in parliament. The European elections will be held on 25 May alongside the second round of local and regional elections. The first round on Sunday saw the candidates of the ruling centre-right New Democracy party failing to make the second round in the municipality of Athens and Attica region for the first time in decades. In a surprising upset, the candidate of the leftist main opposition Syriza succeeded in assuming the first position in the most populated region of Greece (Attica), which numbers approximately 4 million residents out of some 11 million total population. In addition, the Syriza candidate managed to pass to the second round in the “battle” of the biggest municipality of Athens. “Greece doesn’t only consist of the region of Attica. Greece is not only Athens”, underlined government spokesman, Simos Kedikoglou. Alexis Tsipras, the leader of the main opposition Syriza party, said the upcoming EU elections will be a referendum on the bail-out programme of the debt-ridden country. “Next Sunday (25 May) the EU elections will be a referendum against the memorandum. A referendum that never took place in Greece,” Tsipras noted, underlining the stability provided when people of Greece are sovereign. Prime Minister Antonis Samaras, referring to the EU elections next Sunday, had similar words. “It is in the hands of Greeks to contribute in order to ensure that we will move on with stable steps, or alternatively let the country go backwards,” he underlined. The neo-Nazi Golden Dawn candidate for mayor of Athens, Elias Kasidiaris, managed to get the 16% of the vote, coming in 4th position. This is an issue that already created waves across the political spectrum. The majority of Golden Dawn’s MPs are currently incarcerated due to an ongoing criminal investigation on the activities of the party. The Greek Supreme Court though, recently gave the green light for the participation of the party in the upcoming EU elections. According to analysts, the Greek PM Antonis Samaras made wrong choices of candidates in the crucial municipality of Athens as well as the big regions of Attica and Central Macedonia (northern Greece). Instead of supporting widely accepted personalities, Samaras decided to promote members of his own party that finally did not make it into the second round in these regions. “In contrast with others, Pasok left behind the strictly party-based candidates,” said the leader of Pasok, Evaggelos Venizelos, hinting that the Greek PM made mistakes in his personal choices of candidates. However, political analysts in Athens underlined that Venizelos, having lost a large number of voters, had no choice but to do just that. Across the country, New Democracy will have candidates in the second round in eleven regions out of thirteen, while Syriza will have candidates in five. It is not clear how many candidates New Democracy and Pasok will have in the mayoral elections across the country as most of them were not willing to be identified with the governing parties, fearing that such a move would lead to loss of votes. A large percentage of Greek voters cast their ballots this Sunday and most likely will do the same in the second round of voting. It is widely accepted that voters are determined to punish the candidates that are publicly associated with the ruling coalition parties. It is highly likely that if Syriza wins the EU elections by a large majority, the ruling coalition government will find it hard to continue and might choose to call general elections. It seems that developments this week will be crucial for the fragile stability of the government. There are already signs that New Democracy and Syriza will choose to polarize the political atmosphere, hoping to achieve a large turnout of voters. Syriza, or Coalition of the Radical Left, became the second largest party in Greece and the main opposition force after elections in June 2012. The centre-right New Democracy (ND) led by Prime Minister Antonis Samaras won 29.66% of the votes, followed by Syriza with 26.89%. PASOK came third with only 12.28%. 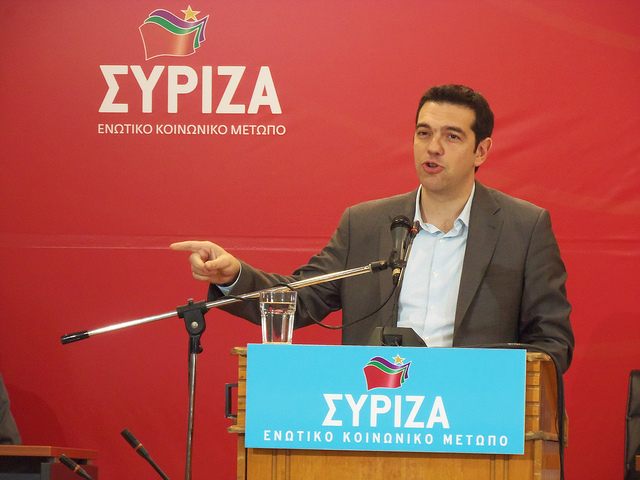 Syriza has shaken up the Greek political landscape, which has been traditionally dominated by ND and PASOK. EURACTIV Greece: ??????? ?????? ??? ???????? : ???? «??????? ?? ?????? ?? ?» ??? ??? ?????? EURACTIV Greece: ?????????? ?????? ???? ????-?????? ??????? ????????? ?????????? ?